Pre-order now! These hooks are fabulous! 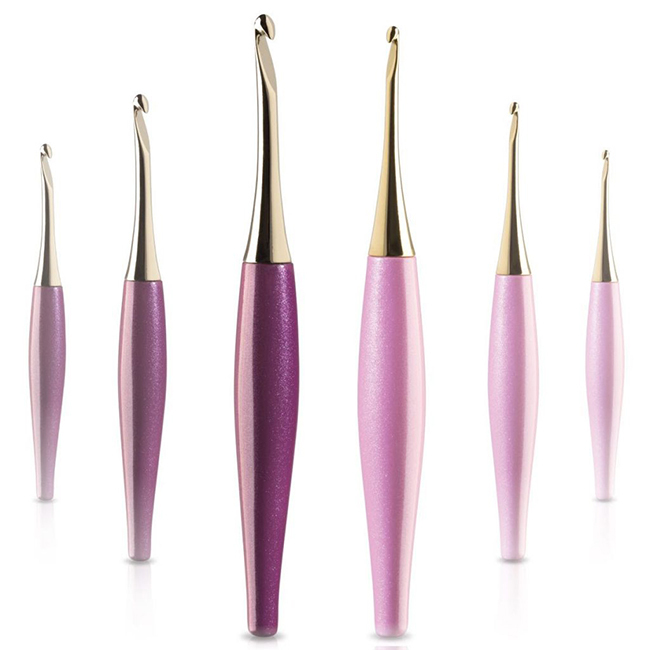 The Pink is gold plated (like the Red) and the Purple is nickle plated (like the original/black). Get yours from the affiliate link below! 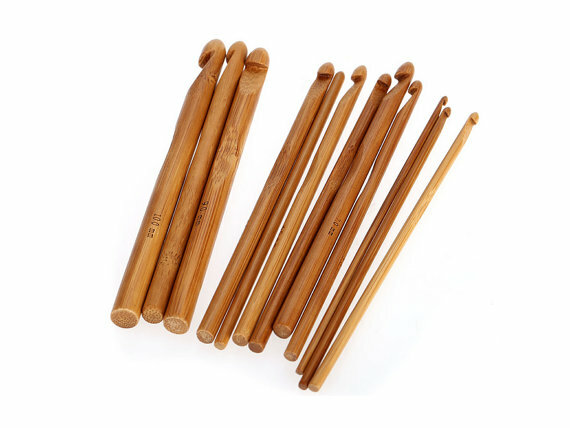 These bamboo hooks are warm and soft to the touch, and durable! This set comes with 12 sizes from 3mm-10mm. This is a gorgeous set of hooks from Knitter’s Pride! This set would make a great gift for the crochet fan in your life (or for yourself)! 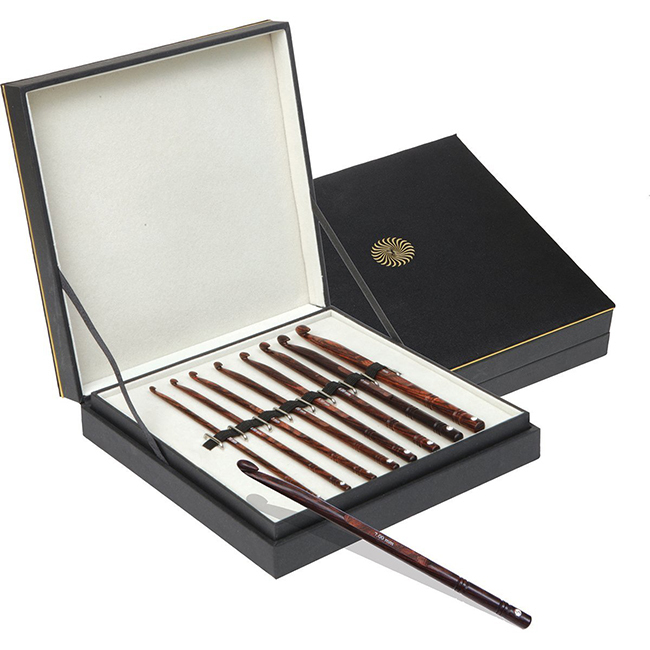 The set includes 8 single-ended laminated rosewood hooks. Get yours today from the affiliate links below! Amazon USA – $53.36! Prime shipping available! Amazon CA – CDN$ 96.99 & FREE Shipping. Amazon UK – £57.19 FREE UK delivery. 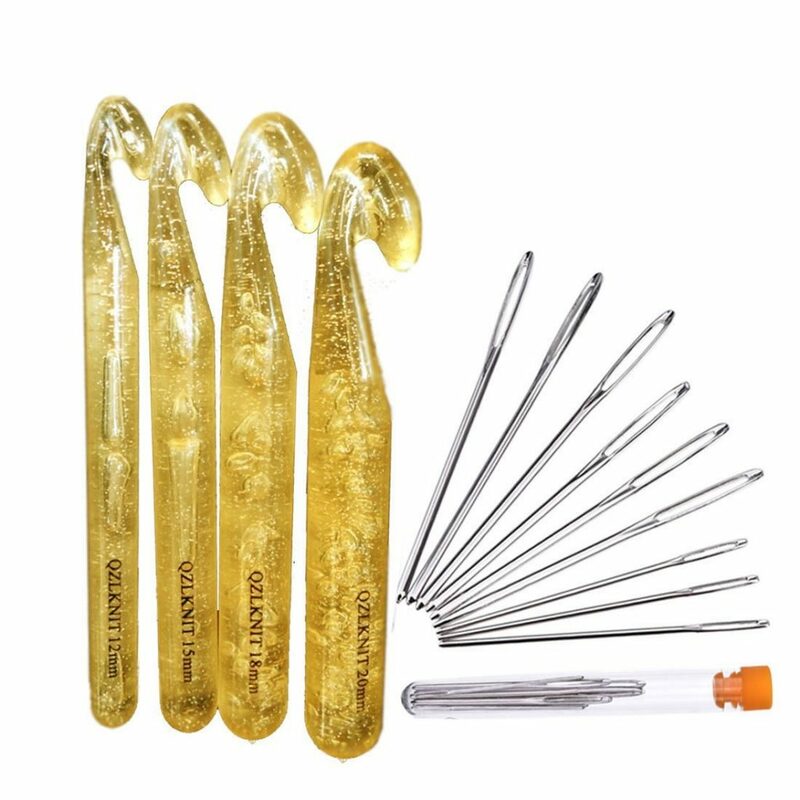 This HUGE Crochet Hooks Set is a wonderful asset to your collection! 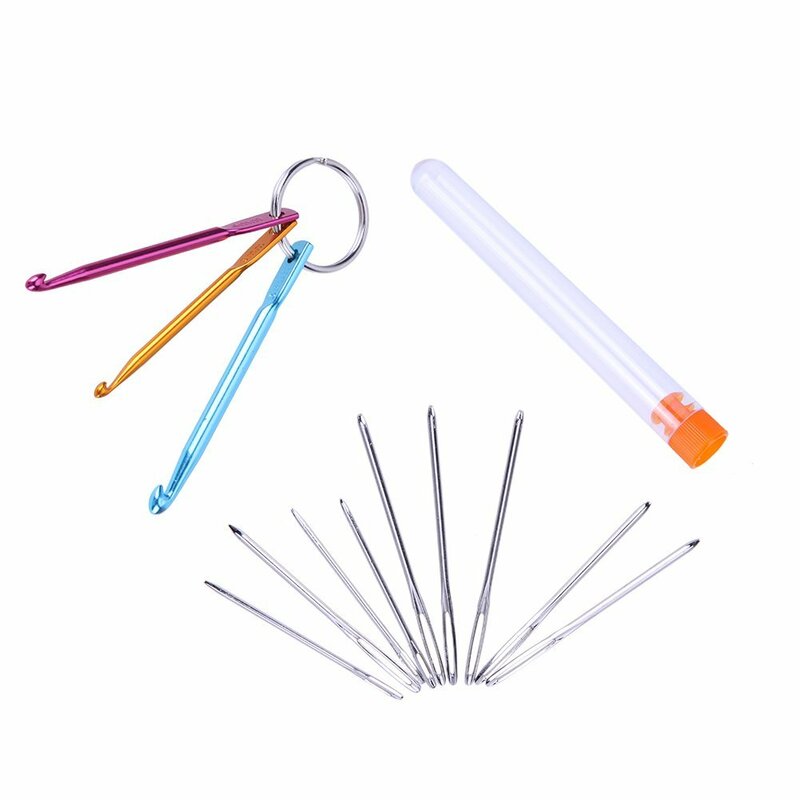 They are beautifully colored translucent plastic crochet hooks. This set includes sizes 12mm, 15mm, 18mm, and 20mm. Great for Beginners! Are you learning how to crochet? The larger hooks make it easy to see what you are doing right (or wrong). The plastic is smooth and comfortable to use. Puts less strain on hands than aluminum styles. If you have the full set of regular metal/soft-handled hooks, you will need bigger hooks for bulkier yarn. So try this set out – they’re wonderful. Get your own from the affiliate links below. Amazon USA – $10.95: 32% off; Gift-wrap and free shipping available! Amazon CA – $9.99; Free shipping available! Amazon UK – £4.99; Free shipping available! Everything you need for your crochet but the yarn, all rolled up in a cute case! WELL CONSTRUCTION: Patent pending. Made of nice quality canvas material. Adorable fabric print. Foldable and lightweight design will not take up your too much space, It is convenient for you to carry everywhere. Rope ties to ensure your items safe and organized. WITHOUT SNAGGING YARN: Crochet needles are enough smooth and have no rough edges, the hook throat is deep enough to catch the yarn, so it will not so sharp to snag or split the yarn but easy to get into stitches. 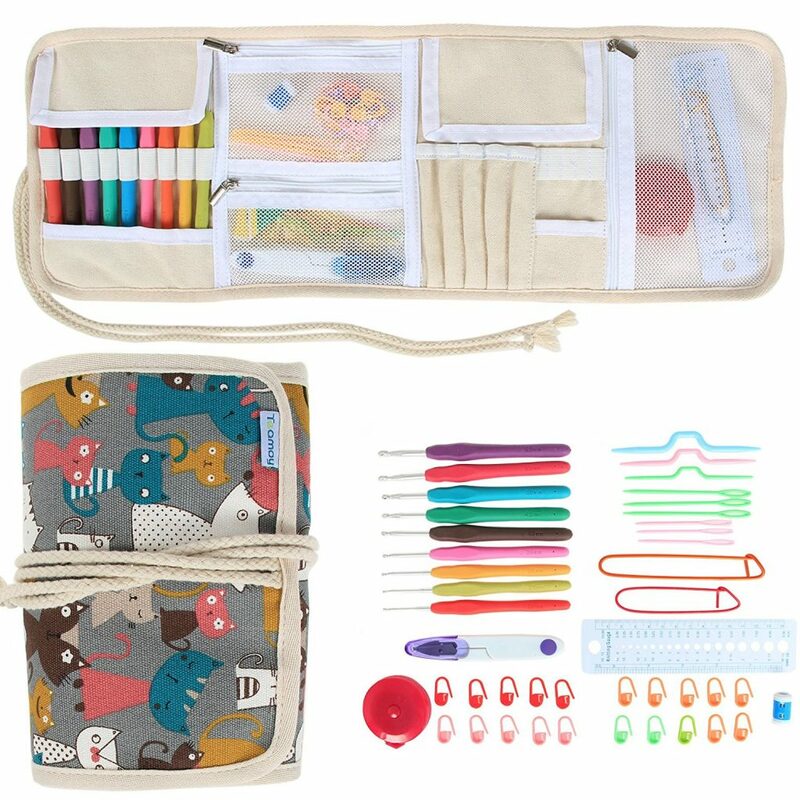 COMPACT AND STAY ORGANIZED: Everything you need to crochet is included in this all-in-one crochet kit, stay organized, never lose anything again and have the tools to take on any project! Perfect for travel or crocheting everywhere, like the airport, a park, home or work. MUST-HAVE: The crochet set is a must-have for experienced crocheters, knitting enthusiasts or a start knitter. 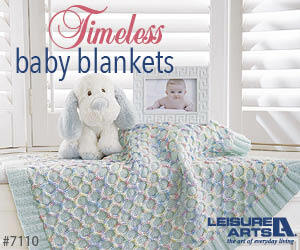 It helps you keep the hooks securely in place when you are not using them. The compact organizer can be put in drawers, boxes or backpacks. Get yours from the affiliate link below. 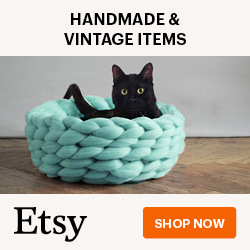 Amazon USA – $15.99; Gift-wrap and free shipping available! 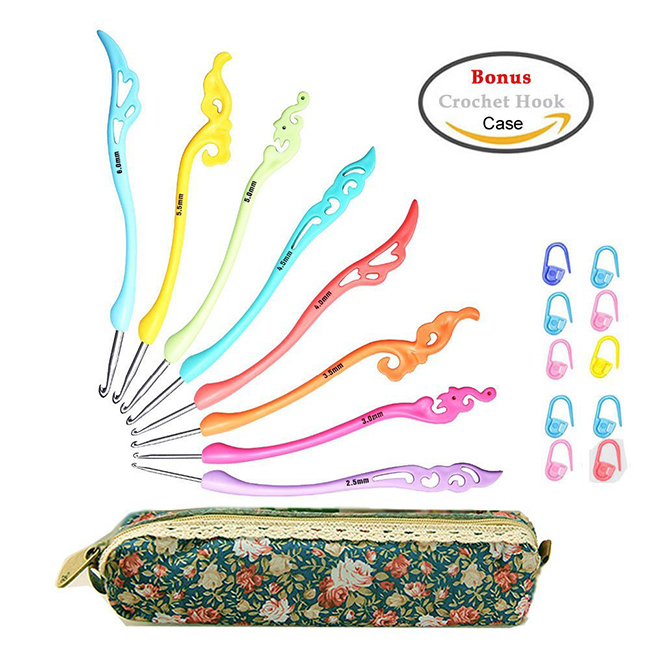 Retro Crochet Hooks w/ bonus case! 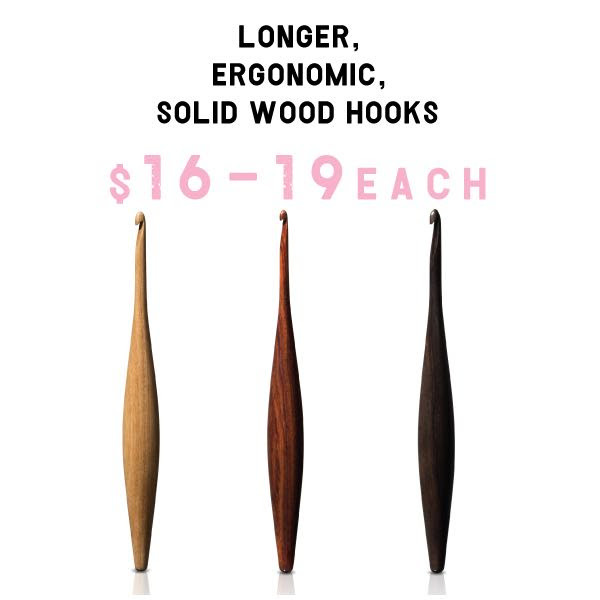 I absolutely adore the funky shapes of these hooks! The ergonomic handles allow for longer crochet times with less fatigue. And it comes with a free case and stitch markers! I know what my key chain is missing: crochet hooks!! Now you can carry a few spare hooks with you at all times. The ergonomic shape grip that developed independently is very comfortable to hold. Excellent item are sturdy aluminum, stamped with the millimeter size. It is convenient to carry anywhere. Amazon USA – $3.99; Gift-wrap and free shipping available! 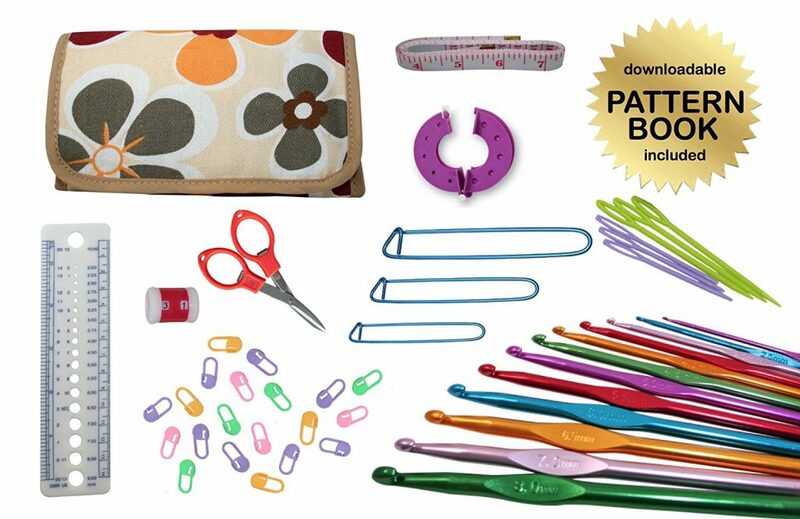 There’s everything you will need to crochet but yarn in this kit!! 1 YEAR MONEY-BACK SATISFACTION GUARANTEE. Even if you return the hooks, the book is yours to keep! Amazon USA – $16.99: 53% off; Gift-wrap and free shipping available!